Today I went down to the workshop, models and sketches in hand, planning to speak to the technicians about my ideas and what I want to build. As usual they are helpful and suggested I make a scaled down version for my mach 1 prototype – one that a child could sit in. But as we got down to the nitty gritty of what the chair would be like we hit some speed bumps. I tried to communicate what I want by showing them sketches of Carlos Motta chairs, explaining I wanted to mimic his style but couldn’t really justify why. I tried by explaining my idea of the chairs being influenced by the Western Isles but the guys in the workshop just didn’t feel that the sketches I was showing them suggested that they could have come from the islands. 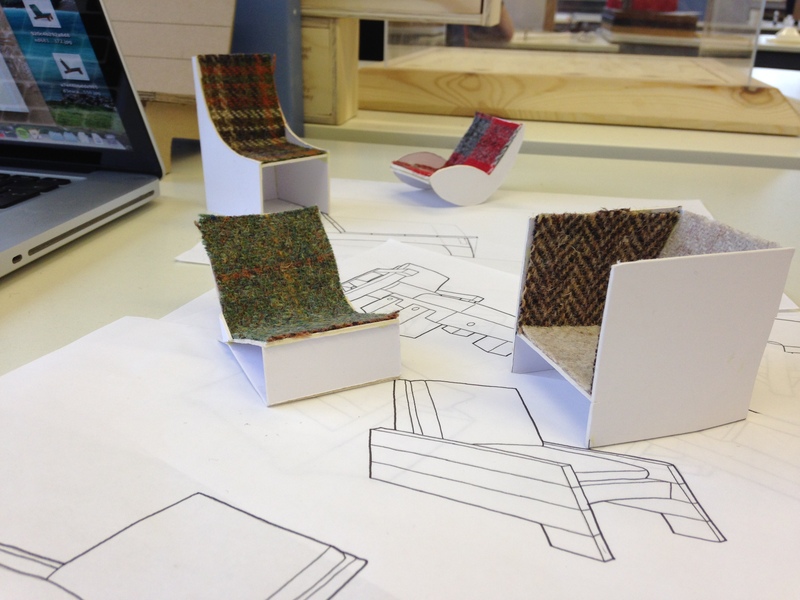 They suggested that if the design of the chair was not relevant then I’d be as well making a simple plinth with Harris Tweed on it. I’m not satisfied with just a plinth. Therefore the chair has to capture the essence of the islands. Otherwise it’s just a chair with some tweed on it which is nothing special. What will make my chair unique? Usually when I go down to the workshop, I wave my arms around trying to describe my ideas and get shown the door: “Go away and come back with some sketches or a model”, they usually say. Today I went down with a bundle of models and sketches and was told “Come back when you have maybe 15-20 models and a hundred sketches.” Great! If I’m honest I’m feeling more stressed after visiting the workshop! What the hell am I even doing? I’m going to try and spend the rest of the week making these models and doing sketches. How am I going to design a chair though, that captures the islands character while keeping the design simple and functional? It’s back to the drawing board I think.